Landscaping on a budget doesn't mean settling for a shabby-looking yard. From plants to patios, from window boxes to water features, you can save money while designing an attractive yard. Many homeowners obsess over controlling lawn weeds. Their obsession drives them to spend money unnecessarily on weed killers such as crabgrass killers. If they are successful in these witch-hunts against weeds, the result may look good but produces an unhealthy monoculture. The experts suggest accepting the presence of a certain number of weeds in the lawn. Their argument is that lawns with some diversity remain healthier than lawns reduced to a monoculture. While crabgrass may be unacceptable, there are some "good" weeds you should be willing to tolerate, such as wild violet (Viola sororia). These violets are not only pretty but also edible. Another beneficial weed is clover (Trifolium), which is a nitrogen-fixer, sharing this ability with other cover crops in the pea family. Clover will fertilize your lawn at no cost, thereby freeing you from adhering to a lawn-fertilizing schedule and saving you from spending money on chemical fertilizers. How do I go about reducing the size of my lawn? I do not wish to spray harsh chemicals on the grass to kill it because I want to be able to allow my children and/or pets to play in this area. After I reduce the size of my lawn, what do I put in place of the grass? Won't it cost just as much to maintain the area when something else is growing there? There are a number of ways to get rid of grass, including ways that stay away from chemical herbicide use. Perhaps the most popular method, currently, is laying down newspapers to kill the grass. What you replace the grass with largely comes down to your personal preferences and circumstances. Those with plain tastes who live in a rural setting and aren't interested in keeping up with the Joneses can simply lay down landscape fabric and cover it with the cheapest mulch they can find. Since the mulch won't be in direct contact with the soil, the process of decomposition will be slowed, yielding the money-saving result that you won't have to replace the mulch as often. If you want to dress up the area, there's no rule saying you cannot install a few container gardens there (as you would on a patio). To stay on budget, make it a point to buy plants when they are on sale and/or from retailers known to sell them at a discount. Be aware, moreover, that some pretty ground covers will spread on their own and "fill in" an area. 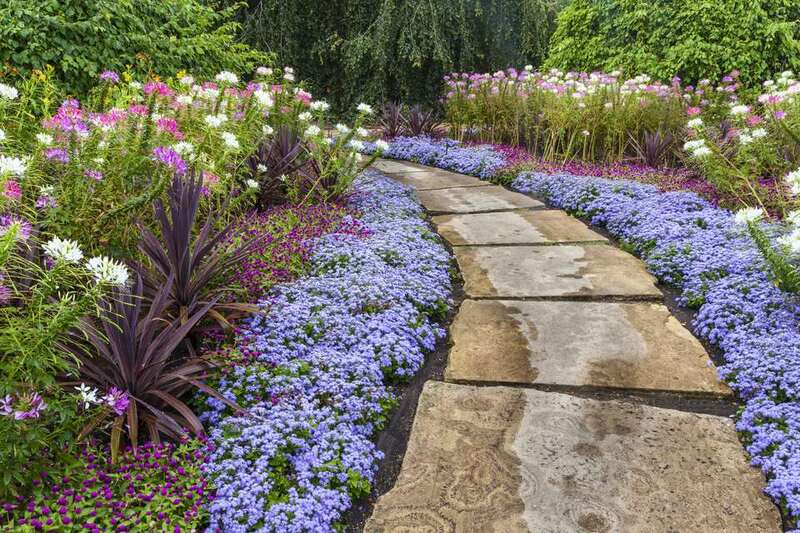 While that may sound bad to a gardener insistent on growing only well-behaved plants, such spreading might be just what you crave if you're looking to cover an area with plants without spending much money. Select drought-resistant plants to save money on watering. Water features needn't bust the budget to make a big splash in your yard. Modern pumps and pond liners are inexpensive and easy for do-it-yourselfers to install. Add some stones and an extra bit of effort, and you can even build small waterfalls. Scrounge around for free stones at construction sites (obtain permission) or on the property of your country cousin. Or go slightly more upscale with a cascading clay pot fountain. Not only water features but other hardscape projects can be easier than beginners at first imagine. It's just a matter of choosing the path of least resistance. For instance, brick patios laid in sand are easier to build for do-it-yourselfers than those laid in concrete. By planning properly, it's also possible in many cases to avoid having to cut any of the bricks, a task daunting enough to drive many a homeowner into paying someone else to lay a patio for them. Similarly, bypass the pricey pros and lay your own stone walkways in sand. Obtaining cheap plants requires an adjustment in our attitudes. Many of us grew up buying plants from sources that specialize in the gardening trade. Such plants are high-quality, but that quality comes at a price. When shopping for cheap plants at sources that don't specialize in the gardening trade, we must resist the temptation to compare apples to oranges. Do I have the time to sift through the cheap plants, in order to select acceptable specimens? Do I have the time to give these cheap plants some extra TLC once I've planted them? Is the extra time expended on selection and care justified by the money that I save? If you don't know what to look for to determine a plant's health, bring along someone who does. At the very least, inspect plants to see if they have any bugs or diseases on them. If they do, then they're not worth bringing home even if they're free. Once your cheap plants are in the ground, practice proper plant care. This is always sound advice, even for high-quality plants. But, in the case of cheap plants, a little extra TLC may be in order. For instance, if the plants have been stressed at the store, you may have to be extra-careful about watering them properly. Supermarkets are only one example. An online equivalent is eBay. You may be able to obtain 10 plants for the price of one by bidding on them via eBay. Sure, several of them may end up dying on you. But you still end up ahead. Again, it's a matter of adjusting your attitude. A good online source for trees is the National Arbor Day Foundation, which often runs specials whereby, if you purchase such-and-such an amount, they'll throw in something for free. You can supplement your early shopping for annuals with the annuals that go on sale at nurseries in July and August. This is an inexpensive way to extend the time period during which your yard can be graced with colorful blooms. Also, some supermarkets put shrubs and perennials on sale at the end of the summer to avoid being stuck with inventory that they can't take care of during the winter. But landscaping on a budget goes beyond obtaining cheap plants. Some plants require more water than others, and water is an increasingly precious commodity. Drought-tolerant perennials are better than most at fending for themselves, which lowers your water bill. Selecting drought-tolerant plants is one part of an overall water-conversation approach known as "xeriscaping ." You can also save money on watering by installing automatic irrigation systems and by applying mulch. Container-gardening makes a lot of sense if space in your yard is limited. The idea makes even more sense if you can obtain cheap containers and plant them yourself. Inexpensive containers, including cemetery logs (which can serve as window boxes), can sometimes be purchased at yard sales. Just be careful to scour them out well in case they harbor any diseases. Whether planting in the ground or in containers, you'll need to fertilize your plants. But don't spend more than you need to on fertilizers when you can feed your plants for free. If you're serious about landscaping on a budget, then one of your first projects should be to build a compost bin. Then just place kitchen scraps, raked leaves, etc. into the compost bin, watering and mixing occasionally, and you'll have a ready source of soil amendments for free. If that sounds like too much work, some cities offer free compost at designated locations on a first-come-first-served basis. This compost is produced from vegetation removed by city work crews.